170g cottage cheese - I used low fat 3 medium eggs 120g oat flour 1 apple, cored and chopped 1tsp baking soda Blend all except the apple. Once mixed add the apple and blend again but you want the mix with small apple bits running through. Put a big handful of blueberries in the freezer in a bag - 15 mins max. Then, fry tablespoons of the pancake mix on a hot skillet with a spray of oil. Keep warm in a low oven. For the sauce, melt a tablespoon of your fav peanut butter with a cup of hot water in a small saucepan on a low heat. Mix really well and add in a tsp cinnamon. 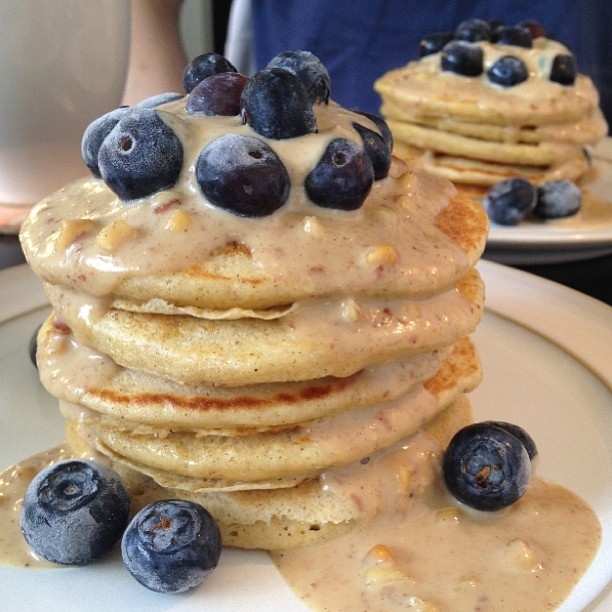 Get your blueberries out and stack!